South Koreans pay lower income and social security taxes among countries in the Organization for Economic Cooperation and Development (OECD) but a higher levy related to real estate properties. In an OECD study released on Wednesday, Korea ranked 32 out of the 36 member states in tax revenue against total gross domestic product (GDP) in 2017. 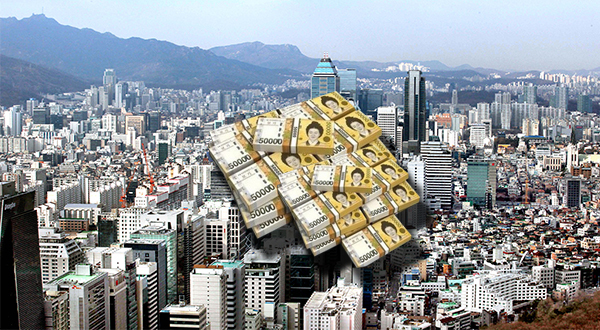 Korea’s tax burden stood at 26.9 percent, lower than the OECD average of 34.2 percent. Japan’s tax-to-GDP ratio was 30.6 percent and the United States’ 27.1 percent. Korea paid relatively less tax on income and profits, with the tax-to-GDP ratio standing at 8.6 percent to finish 25th. The OECD average was 11.4 percent. Countries with high income and profit taxes included Denmark (29.1 percent) and Iceland (18.6 percent), while those with low taxes were Turkey (5.3 percent) and Lithuania (5.4 percent). Korea’s social security contributions to GDP were also low, coming in 23rd at 6.9 percent. At the top were European countries including France (16.8 percent), Czech Republic (15 percent) and Austria (14.5 percent). Among those at the bottom were Mexico (2.1 percent) and Chile (1.5 percent). The U.S. and the U.K. both came lower than Korea, at 6.3 percent and 6.4 percent, respectively. Korea stood ninth in terms of taxes on property, with the tax-to-GDP ratio at 3.1 percent, higher than the OECD average of 1.9 percent. Other countries at the top were France (4.4 percent), the U.K. and the U.S. (more than 4.2 percent). At the other end of the list were Estonia (0.2 percent), Mexico (0.3 percent) and Lithuania (0.4 percent).